i was invited to speak (yes, speak!!) at my local MOPS group this morning. 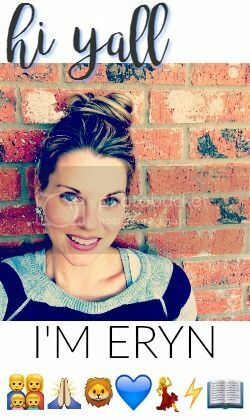 while i'm there, i want to share with you some things that have been on my mind and in my heart- with links so you can read all about it. 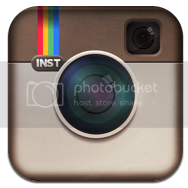 grab a cup of coffee, sit back, and click around to your heart's content. 4 Days to a Forever Marriage - this sweet couple has been married 47 years. i hear her choke back tears, and i hold back my own, as she affirms "marriage is work, and... it's worth it." click over to see the video about the book that we will be giving away at the next Moms of Master Books Twitter Party on Nov. 15. 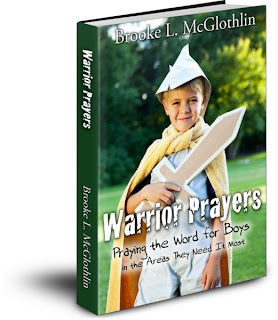 Warrior Prayers: Praying the Word for Boys in the Areas They Need it Most is an e-book prayer guide for Moms of boys and a parenting resource with promises for those of us raising godly men written by my friend Brooke McGlothlin. i just had to tell you about it because it is on sale now for just $.99. One Verse: the movement - can you imagine not ever knowing about Jesus because no one could tell you in a language you could understand? One Verse is putting an end to that as they translate Bibles into the native language of lost languages around the globe. if this tugs at your heart the way it does mine, here's how you can help One Verse. Savoring Living Water - when it comes to QT with JC, i'm thirsty. i want it, i crave it. but i get distracted and time gets away from me. this book addresses that very struggle and offers tips for making your quiet time with the Lord effective and meaningful. 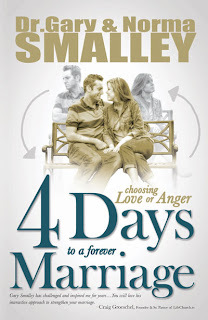 the e-book is just $5.49 and $2 of every copy sold will be donated to One Verse. Operation Christmas Child - this coming week is National Collection Week for Operation Christmas Child. grab a shoebox, fill it with little trinkets and toys, and get it to your nearest drop-off location. 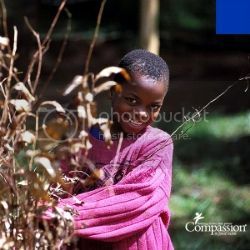 this is our opportunity to do something to bless the lives of children living in dire conditions. 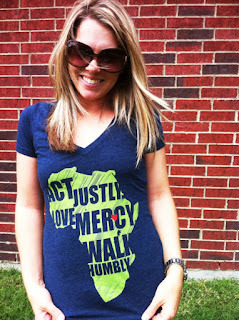 Mercy House Kenya - i'm sure you've heard about what my friend Kristen is doing for pregnant women in the slums of Africa. you can read all about The Mercy House here. 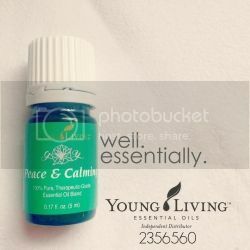 if you are getting a jump start on Christmas shopping, why not buy a gift that supports a good cause? that t-shirt i'm wearing is from The Mercy Shop. Veggie Tales and What's In The Bible - speaking of Christmas gifts, i know two children who would love to have both of these DVDs in their collection. i was honored to help my goofy friend Amanda make this video for Veggie Tales Little Drummer Boy. i love Amanda and the Veggie Tales that much. and here are ten reasons i love and will get my kids What's In The Bible, another favorite series of Bible-teaching silly shows. and that is what has been going on around here lately. well...in my head and heart anyway :) have a great weekend, everyone!